Let me begin by thanking all of you for your leadership and stewardship through the California Economic Summit and your work in the regions of California to advance equitable and sustainable prosperity for all. 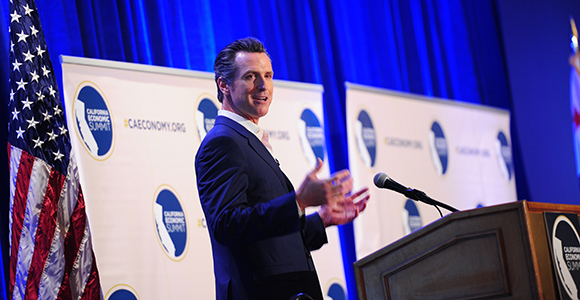 I am grateful that from the beginning you embraced my 2011 plan, “Economic Growth and Competitiveness Agenda for California,” and that I have been able to participate in each of the six previous Economic Summits. I know that we are united by our triple-bottom-line values and our understanding and commitment that California’s future will be shaped in large part by the vibrancy of its richly diverse regions. I would be with you today, but just last week you gave me a pretty large assignment – and I am putting every calorie every day into the giant task of assuming the responsibilities as your governor. Please know that my focus on this transition is the best way that I can contribute today to the comprehensive agenda that you have developed over these years – and that you have bolstered during this Summit. I strongly endorse the Summit’s embrace of making sure that every child is cared for and nurtured so they truly have a shot at the California Dream. I look forward to reviewing your ideas for how we can build on the Summit’s One-Million Home challenge to reach the 3.5 million home goal that I called for during the campaign. I am eager to see the Summit’s ideas for how we can create more resilient communities, and for how we can revive rural resource-based economies in ways that also reduce catastrophic fires and support our climate change goals. And finally, I welcome your suggestions for how we can measure our progress and focus our resources and ingenuity to restore the CA Dream for all Californians, in every region of the State. We have an enormous lift ahead of us. I am honored to be asked to lead California, and I look forward to working with all of you to make California more sustainable and prosperous for all.